I recently discovered a great blog on Israeli design by Ziva Haller called Designist Dream (say designist slowly). She reports on furniture, decor, fashion and all things design-related going on in Israel or abroad by her Israeli compatriots. Ziva's recent posts on Israeli designed furniture shows this: you may think it's Italian or German designed but, alas, it could be Israeli designed. Israeli designers work for design houses Zanatto, Kartell, and Alessi. 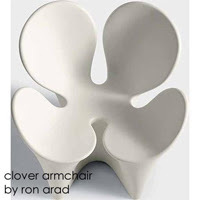 For example, at right, The Clover chair by Ron Arad for Italian furniture house Driade. Learn more about Ron Arad in Ziva's blog post here. Learn more about Arik Levy in Ziva's blog post here. Expect more great insider Israeli information from Ziva coming soon!